On this page, for this sensational home made pumpkin pie, we attend to the first stage of the tutorial for this delicious but incredibly easy home made pumpkin, bacon and egg pie. 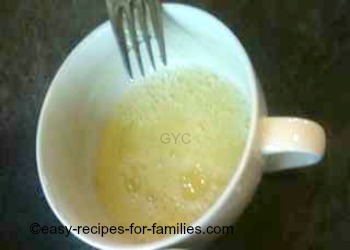 This is one of the easy recipes that looks like a lot of effort's gone into making it, yet is incredibly simple to do. 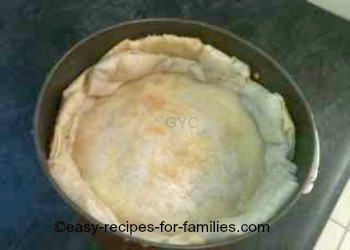 On this page, we learn how to use the rolled-out store-bought pastry to make a crunchy pie crust. Before starting, turn the oven on to preheat at 350F/180C. 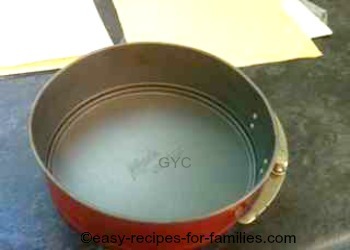 If your springform pan is not non-stick, be sure to grease it thoroughly and line the base with greased baking paper. Check to ensure that the sheets are fully defrosted. If they are still frozen they will crack when dropped into the baking tin. Just drop one rolled out sheet into the springform tin, centering it so that the sheet goes up the wall, just like in the picture. 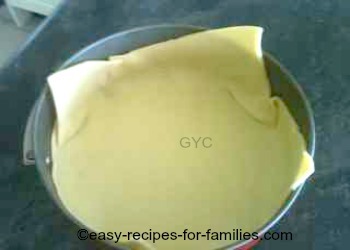 Lay the second sheet of pastry at 90 degrees to the first one so that the surplus pastry goes up the remaining exposed walls. The objective is to line the pan walls with rolled - out sheets without the fuss and bother of cutting precise widths. 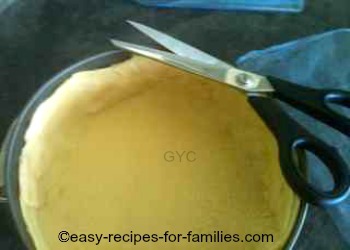 Using a pair of kitchen scissors, trim the tops so that the top edge is fairly even. 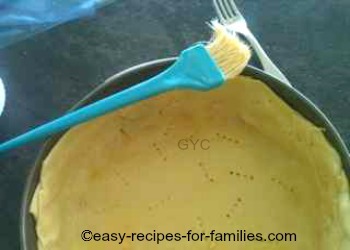 Use the trimmings to patch the walls so that the entire wall of the pan is lined. 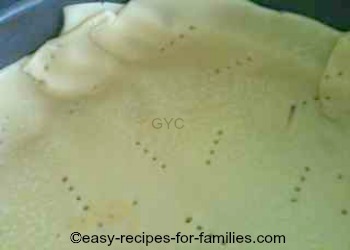 For easy recipes, there's no need to be absolutely precise about the straightness of the top edge, as you will see in the photo, it's pretty raggedy. Prick the double sheets all over with the tines of a fork making sure to prick the walls as well. See how I've generously pricked it all over, up and down the walls and the base. 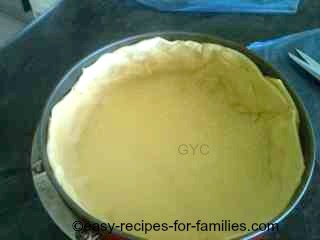 It is important to apply the wash as it seals the pie crust and prevents the pie filling from making the base soggy. Bake the shell for 15 minutes. It will look light brown and will be hard to the touch. Just like this. While the easy-to-make shell is being baked, attend to preparing the home made pumpkin pie filling by cooking the bacon and fresh pumpkin. 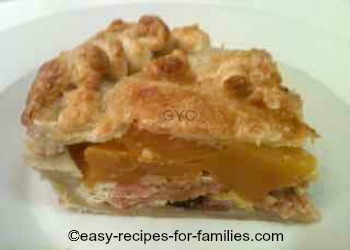 Leave Home Made Pumpkin Pie to discover loads of scrumptious easy recipes for baked treats!